Making Life a Bliss Complete: Freecycle Baby...Oh Yeah! She looks delighted with it! You got a pretty decent one. Our Freecycle is pretty sad, but sometimes you can find good stuff for cheap on our Craigs List. 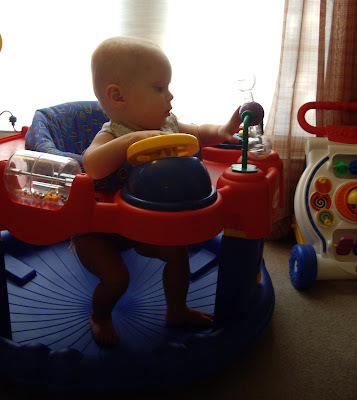 Have you seen IJ's exersaucer gadget? Search for the Fisher-Price Intellitainer and have a good laugh. 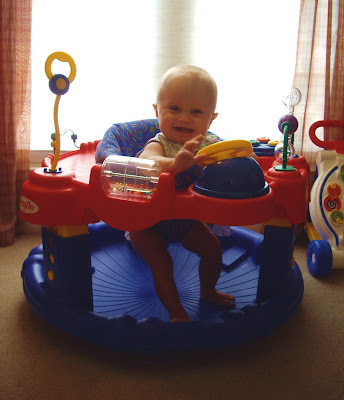 I do have the first exersaucer pictured!!! (actually, i am borrowing it from a friend that has all the baby gear one could imagine). 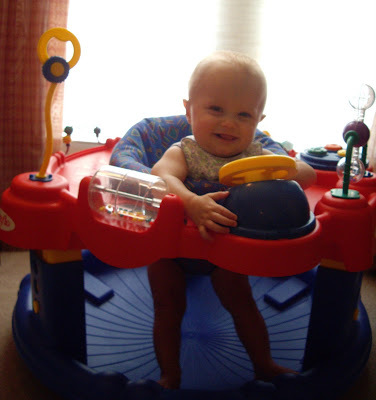 Fuzzers is in heaven in his cadillac space station exersaucer. I just wish it was ours. He's been spoiled. I am sure Brooke feels giped since we had preatically nothing for her. sorry, i spelled pratically wrong! Wow! Fuzz totally ranks in the "how much do you love your baby" contest! Borrowing--now that's the way to go! Miriam! That is the same excersaucer we bought for Kate!!! It lasted three wonderful children. We just got rid of it--it was pretty used! Funny post!